Oh, good, I thought as I walked down to the corral with camera in hand. There’s a lot of dust today; my branding pictures will look so cool! 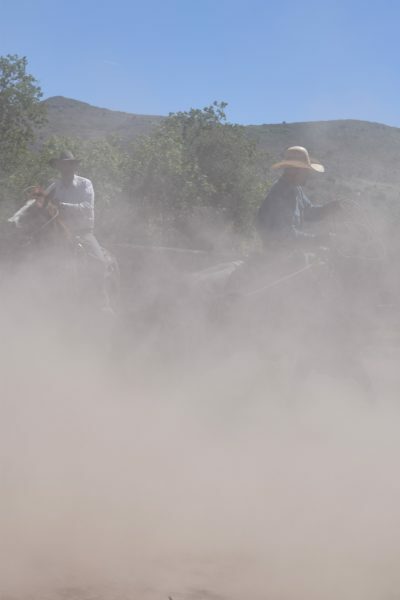 But that spring day during a drought at the O RO Ranch in northern Arizona held more dust than I bargained for. I could barely see what was in the frame of each shot before I pressed the shutter. I think it held more dust than anybody bargained for. 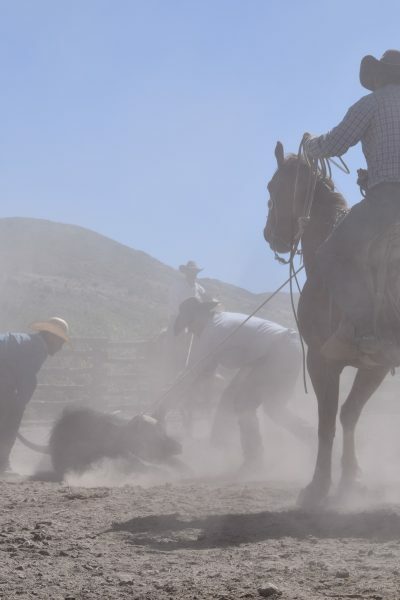 The cowboys could hardly see the calves they were roping. If someone had showed up with a portable shower and a stack of towels, they could have price gouged the bejeebers out of the cowboy crew, and each one would have happily paid a sky-high price. Because on this day, the cowboys were camped out at the Triangle N for the spring wagon. They were sleeping in bedrolls and tipis, eating three meals a day cooked in Dutch ovens and served on tin plates in the big canvas cook tent. There were no flush toilets, ice-cold tap water, or hot showers. And their next day off was over a week away. All the dirt that got in their ears and under their shirts was there to stay for several more days. Here, things were getting a little dusty, but each separate livestock entity was still clearly identifiable. 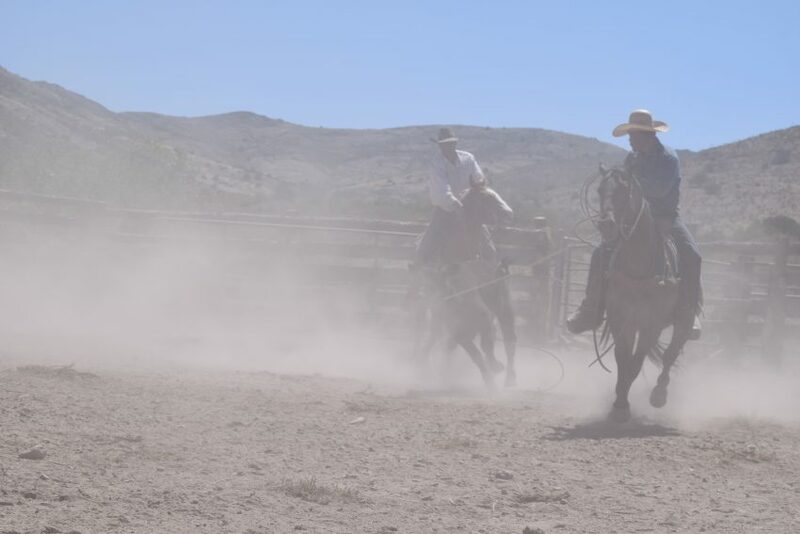 As the dust swirled thicker and rose higher, the cowboys adjusted their heeling technique from “get in timing with the hops” to “open your hand as soon as you can see hocks through the dust.” They might only get one shot, so it was best not to waste time trying to track up. Holy moly. Is there even a roped animal in this picture? I think so, or else the cowboy on the right dallied and rode left without a bovine on the end of his rope. Seriously, how did these guys even manage to heel anything? I’m guessing their years’ of experience must’ve helped, because they somehow got all the calves branded. As the day wore on, my excitement over the dust quickly faded. I was no longer super excited about this dirty work and my pictures; I honestly had no idea what was in half of them. I just knew my kids’ faces were completely covered in dirt. I didn’t have a mirror handy, but I had a hunch I, too, looked like Pig Pen. Spoiler alert: I was right. My family went through a LOT of Q-tips that night. 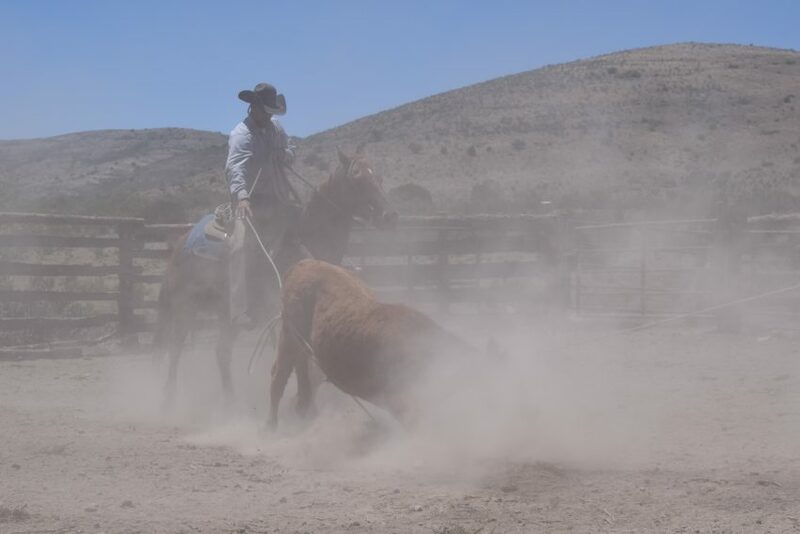 The dust was great motivation for accurately throwing a rope, because the only place worse than being horseback in all that swirling dirt was being afootback working the ground. Q: Why didn’t they use a water truck to wet the corrals? A: Because these remote cow camps use a generator to pump water, and when you’re over an hour’s drive from the nearest fuel tank, you’re not about to waste precious resources on niceties like wetting down a corral. You save the water for drinking and filling livestock troughs. Besides, not one of these guys complained. I guess they must like being a cowboy enough to not mind the dirty work.